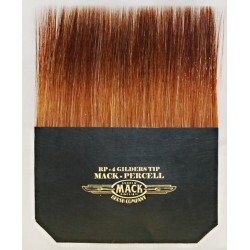 Buy Gilder's Tips-Gold Leaf Application Brushes for sale here. Gilding tips help you pick up and transfer loose leaf from books of "loose gold" when water gilding for mirroring or Reverse glass gilding. Gilder's Tips-Gold Leaf Application Brushes. Gilders Tips pick up gold leaf after we charge them. To Charge a gilders tip, I use Lard Oil, apply one drip to my finger, then I rub my fingers together to soak in the oil so when I apply the Lard Oil to the Gilders Tip my finger are not too wet, then I stroke both side of the Gilders tip to transfer a small amount of the Lard oil to the gilders tip twice, now it's charged. The term Charged can be confusing seeing many associate the term with Electricity similar too Static Electricity. Now we all seen a gilders either in movies or through stories stroke the gilders tip in their hair, this wasn't to charge the Gilders Tip with Static Electricity, but rather to pick-up oils from the Hair products that use to be used commonly like Dapper-Dan or Vaseline. Static Electricity will actually wrinkle your gold leaf thus wasting the precious metal. If your tip is ever showing signs of Static Electricity, you can wet your finger with a small amount of your water size and wipe across the upper top of the Gilder's Tips-Gold Leaf Application Brush, this should remove the charge of Static Electricity , so that the charge of Lard Oil (must be refined oil to avoid acids that attack gold leaf) can do it's job. Gilder's Tips by Ron Percell, Every once in a while you may need to clean your Gilder's Tips-Gold Leaf Application Brushes, if paint or oils contaminate the brush, simply use thinner to clean oil the contaminates then wash out with soap and warm water. After each use or cleaning, reshape the brush while wet for storage too keep the brushes original form. Individual Gilder's Tips-Gold Leaf Application Brushes listed BELOW!